Most birdwatchers who visit Nicaragua complain of the lack of resources available for birdwatching and nature tourism in the country. In part, the issue is that relatively little has been done to document our wildlife here. Our bird research team at Estacion Biologica FUNDECI/GAIA is working on that: we have made the first records of some 25 bird species in Nicaragua (see the final paragraph of this entry for links to the articles). This country is obviously still under-researched, and many more species await the careful observer. Several of those first in-country records came from our observations in Laguna de Apoyo Nature Reserve. At Estacion Biologica, we are helping to fill the knowledge gaps through study of bird populations using two methodologies: point counts, and mist netting. The latter approach is far more labor intensive but among the benefits of its use is the opportunity to appreciate a bird "in the hand". Below are a few photos from a recent mist-netting expedition. The Long-tailed Manakin (Chiroxiphia linearis) male is stunningly beautiful. This male is still in the mist net, made of fine nylon threads which are stretchable to facilitate bird removal. More than fifty birds of this species were captured during the May 2011 mist netting activity. Photo by Lukas Betthauser. Marlene Kroner, a DED volunteer, performs the tedious task of data entry. Several observations and measurements are made on each bird before releasing it into the wild again. Photo by Lukas Betthausen. Each mist netting activity involves three or four days in the field. During the dry season, hammocks are extremely comfortable for sleeping and for a midday nap. Photo by Lukas Betthausen. The head of a Rufous-tailed Hummingbird (Amazilia tzacatl) glimmers. Photo by Lukas Betthausen. A female Long-tailed Manakin (Chiroxiphia linearis) is quite drab in comparison to the adult male. Photo by Lukas Betthausen. Among the spectacular birds of the forests of Laguna de Apoyo Nature Reserve is the Elegant Trogon (Trogon elegans). The bird is quite docile in the hand in spite of its large size. Photo by Lukas Betthausen. Female and immature birds are often drab and even camouflaged in comparison to their male counterparts. This Painted Bunting (Passerina ciris) female has a beautiful green color on its upperparts but it does not compare to the male. Photo by Lukas Betthausen. Red feathers can be seen among the yellow breast, suggesting this Painted Bunting (Passerina ciris) is not a female, but rather, an immature male. Photo by Lukas Betthausen. This Painted Bunting (Passerina ciris) must be an immature male, as its red breast feathers have begun to come in. Photo by Lukas Betthausen. Some of the first records of bird species registered by our team are found in publications in the journal Cotinga, to find the articles click on Cotinga (2008), and Cotinga (2009). We are grateful for the support received in this work by DED, US Fish and Wildlife Service, and several other individuals and organizations mentioned in the articles. Our research on birds is helping to protect the wildlife habitats of Nicaragua. Our research group is the most-published of any in the country, and we are leading the way among conservation professionals in identifying needs and presenting solutions. 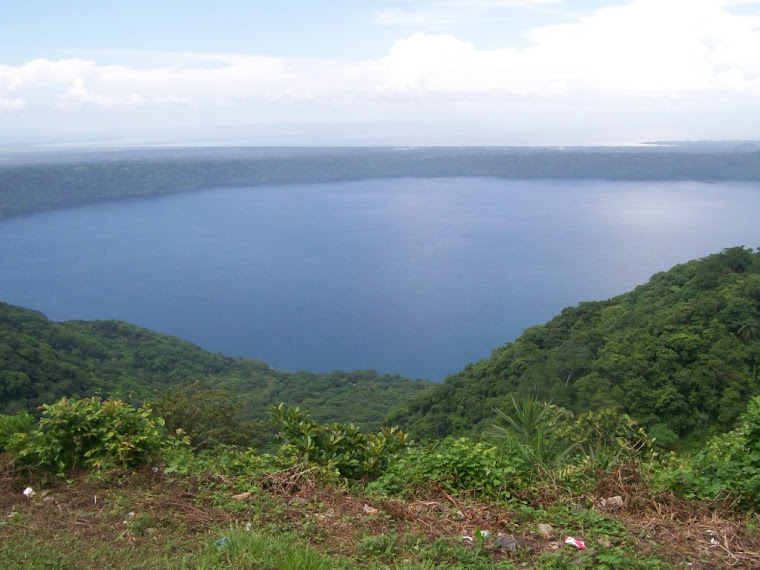 Our research and conservation activities are directly supported by the Laguna de Apoyo Spanish School. By studying Spanish with the school, you help support the wild nature of Nicaragua. Would you like to help us with bird monitoring? We are seeking volunteers. Please let us know if you would like to participate. We have projects appropriate for volunteers without any specific qualification, as well as students and researchers in the biological and environmental sciences. We are happy to go birdwatching with you if you would like a skilled companion, too. Whether as a volunteer, donor, researcher, or birdwatcher, your participation helps us learn about and protect the birds of Nicaragua.